Speaking fees are inclusive of airfare, hotel, ground transportation, food and all other miscellaneous expenses. Fees also includes pre-speech interviews so Bruce can customize his presentation to meet the goals and objectives of your meeting. Additional savings are available if you select his “Pre-Pay Option.” Ask for more details on this option. Bruce will make every effort to be accommodating and work within your budget. He books his engagements 3-24 months in advance. 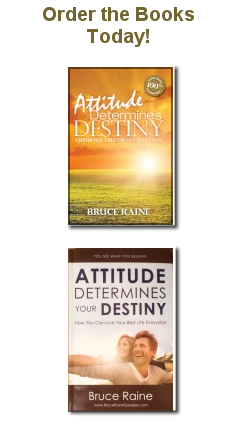 Bruce also offers volume discounts on his book, Attitude Determines Destiny, to be given out or to be included in your conference amenity bags to be given to all attendees upon meeting registration.